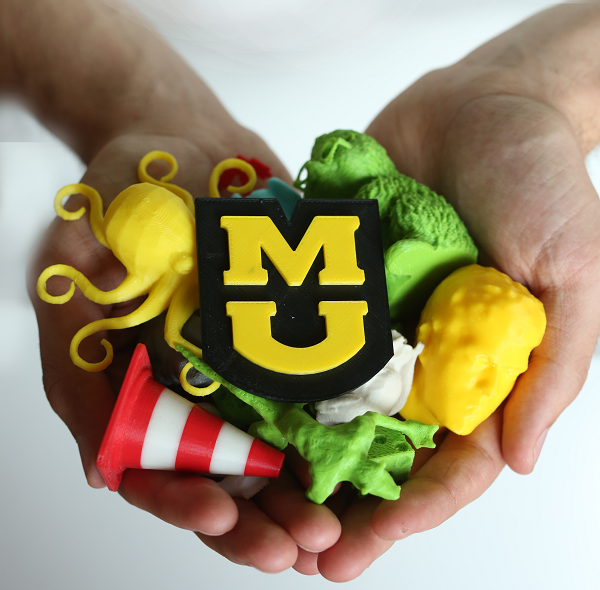 Print Anything at MU began as an IIF funded pilot program for the University of Missouri, oriented towards providing access to 3D Printing. At the end of the grant the equipment was transferred to the University Library which now maintains the service. Everyone from 3D Printing veterans to people with no experience are invited to use our service. Our staff will guide you through the process and provide you with a price estimate based on the size of your print. Where should I go to find the 3D Printing service? How can I have something 3D Printed? Contact us by email with your file attached and we will attempt to provide you with a price quote. It would also be benifical to provide a brief description of the part and the intended size. What do I need to know before I submit a 3D print job? In order to print something, you will need a “.stl” file. This is a form of 3D model that is specially used in 3D printing. You will provide payment when you pick up your print from the Library Service Desk. We accept checks, cash, student charge, and other MO Codes. Turnaround time estimated 3-4 days depending on demand. What size and color available for 3D Printing? Max print dimensions 255 W x 205 H x 205 D mm (10″W x 8″H x 8″D) An additional fee may be applied based on specialty filament if used during the printing process. Colors currently available: Black, white, silver, yellow, red, green, purple, pink, orange, and blue. Do not be afraid to ask for a color that is not listed, if demand for a particular color is high enough, we may purchase additional offerings. What does it cost to have something 3D Printed? Our pricing is based on the type of material used, the amount needed, and the time required to print it. Most prints will fall into the $5.00-$10.00 range. If your print is small, we will charge a baseline $5.00 for prints that amount to less than $5.00 in order to cover the costs of our student workers. Don’t have a file of your own? The library reserves the right to prioritize requests supporting coursework or research with a University of Missouri faculty member. Unsafe, harmful, dangerous or pose an immediate threat to the well-being of others. This includes entire weapons or parts thereof. Obscene or otherwise inappropriate for an educational or research environment. In violation of intellectual property rights. For example, the printers will not be used to reproduce material that is subject to copyright, patent or trademark protection.